100% recycled Kraft paper exterior lined with 30% recycled 3/16” air bubble cushioning. All of our bubble-lined mailing envelopes are self-seal and tamper-proof. 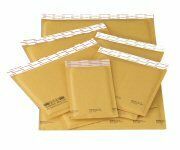 Lightweight, yet very sturdy, our Golden Kraft yellow bubble mailers hold up under the toughest mailing conditions. Size may vary by ¼”. 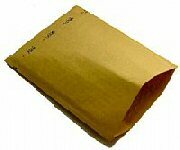 Browse these categories under "Bubble Mailers - Kraft"